Tom Guilmette knows his way around a camera. He is a master at creating beautiful imagery. But it’s not just images Tom is good at creating. I should say that it’s not just any kind of slow motion that makes the video interesting to watch. It’s super, duper, like stupid crazy slow motion. Like 2,546 frames per second at 1080p slow motion. Yeah, I know. That’s freaking slow. (Or fast, depending on how you look at it). 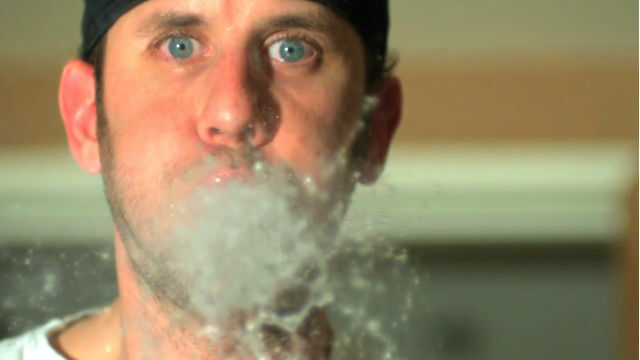 But, IMHO, what makes this video so entertaining is NOT the crazy slow mo. It’s the sound design. Tom Guillmette (filmmaker, cinematographer, and edumactor) enhanced the video by adding sounds to the images that take it to a whole new level. It’s an excellent example of the power of audio to make even the most simple divine. Good sound design is one of the areas where I think a lot of filmmakers fall incredibly short. Even me. As consumers of Hollywood fare, we take good sound design for granted. We sit back and we watch summer blockbusters and autumn Oscar-bait not 100% conscious of the fact that just about every sound we hear is added in post. Explosions. People laughing in the background. Water running. All are added after the fact to give a film depth and realism. The easiest way you can dramatically improve the quality of your productions TODAY is to invest in the time and/or gear to enhance audio quality and sound design. For you photographers: get yourself some professional lav or boom mics and stop using your DSLRs on-camera mic for those video podcasts. For you filmmakers, take the time to think about ways in which you can add background sounds to your pieces. While on set, record some additional audio from the environment that could be used in your final piece. When submitting proposals to clients, add to the budget enough to hire a dedicated audio pro. Go crazy. If you can’t see the videos in your email or RSS reader, click here. While in L.A. last weekend, I recorded a FlipSide video of Tom talking about how he made some of the sounds you hear in his video. Some great tips! For me the coolest thing about that video is that such creativity came out of just a simple hotel room. For all those people that think they need an entire Hollywood set to make something great need to watch this. Thanks for the comment Dave. So true. So true!